Micro-level instructional design refers to the practice of designing and producing small units of instruction. 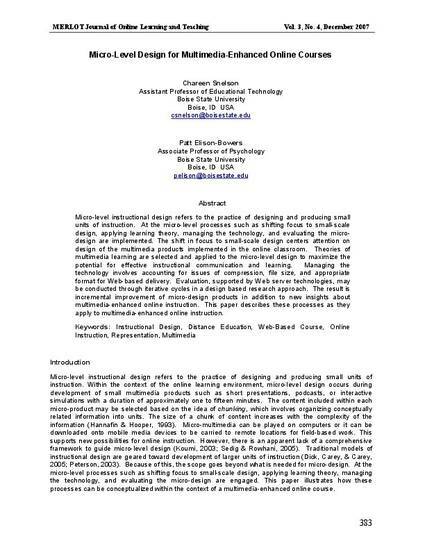 At the microlevel processes such as shifting focus to small-scale design, applying learning theory, managing the technology, and evaluating the micro-design are implemented. The shift in focus to small-scale design centers attention on design of the multimedia products implemented in the online classroom. Theories of multimedia learning are selected and applied to the micro-level design to maximize the potential for effective instructional communication and learning. Managing the technology involves accounting for issues of compression, file size, and appropriate format for Web-based delivery. Evaluation, supported by Web server technologies, may be conducted through iterative cycles in a design based research approach. The result is incremental improvement of micro-design products in addition to new insights about multimedia-enhanced online instruction. This paper describes these processes as they apply to multimedia-enhanced online instruction.